(NaturalNews) In one of the most devastating acts of destruction of its own credibility, Facebook engaged in yet more censorship of Free Speech with the suspending of an account that posted a photo of children rallying against Monsanto during today's global March Against Monsanto. 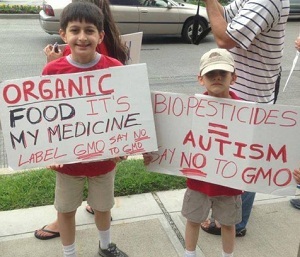 "ORGANIC FOOD It's My Medicine - Label GMOs - Say NO to GMO"
"BIOPESTICIDES = AUTISM - SAY NO TO GMO"
"FACEBOOK: You have been restricted from Interacting With Pages until Saturday, June 8, 2013 at 6:47pm." At this point, Andrea can only re-post other people's content but is disallowed from posting her own content. Why? Because children with signs are obviously very, very dangerous to the establishment. 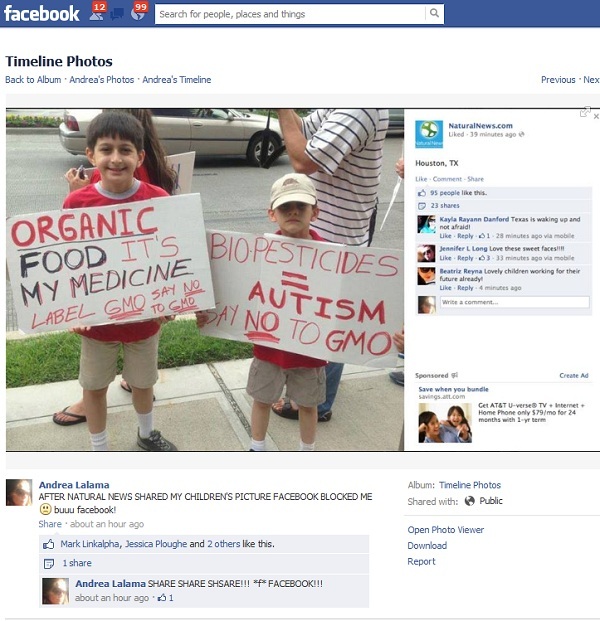 See the photo of two children that Facebook says is "abusive"
As the following screen capture shows, another FB user named Georgia Gallucci also had her account suspended by Facebook after "reposting a friend's photo from the Monsanto March." 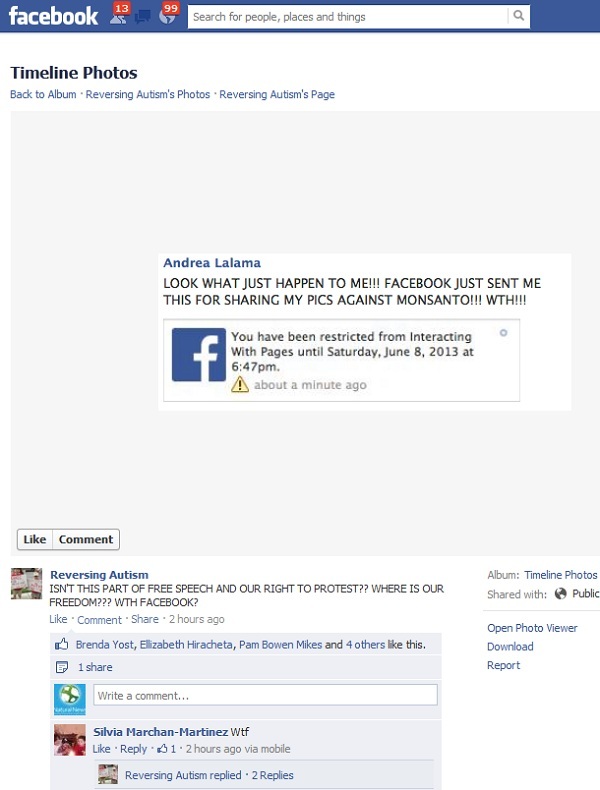 Yet another account called "Reversing Autism" was also suspended by Facebook for posting Monsanto march photos. The following screen capture shows the Reversing Autism account being labeled by Facebook as posting content that is "abusive." Astonishingly, Facebook believes that a corporation growing corn engineered to contain a deadly poison is not abusive, but talking about it IS abusive! Remember, Facebook previously censored a Gandhi quote infographic, claiming it violated its "community guidelines." Facebook hit Natural News with a "final warning" and threatening to permanently delete the Natural News account. Facebook has also been caught in the outrageous abuse of Free Speech through the censorship of people who have all sorts of non-mainstream views, including people who believe in the Bill of Rights and the U.S. Constitution. So this Facebook censorship is nothing new, and in light of recent revelations that the U.S. government engaged in an outrageous abuse of power to threaten, intimidate and silence certain groups through the IRS, many people are now questioning whether Facebook actually is part of the government surveillance grid that intentionally suppresses information the government doesn't want to be seen.